Greenwich Park is looking particularly splendid during this unusually sunkissed summer, and visiting the Royal Observatory for their Alien Season is as good an excuse as any for a walk through the park. 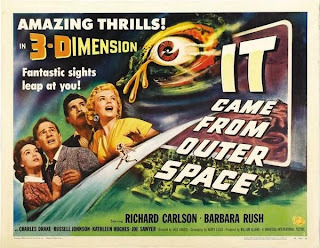 We've already seen the classic 'War Of The Worlds' in the Planetarium at the ROG, and we now follow it with another classic, 'It Came From Outer Space' - itself followed by an interesting talk on the possibility of alien existence. Written by acclaimed scribe Ray Bradbury, 'It Came From Outer Space' plots the crash landing of aliens onto the Earth and their discovery by humans, who are unsure of their intentions. Are they peaceful? Are they harmful? The film, while being somewhat slow-paced and incredibly cheesy at times, successfully reflects the Cold War paranoia of its time. The real draw of these Alien Season screenings is the time taken before and after the screenings. (As well as being able to see a film in the rather unique setting of a Planetarium.) The bonus before the screening is that patrons have the chance to have a look around the excellent ROG galleries after closing time - meaning a relatively empty and hence more enjoyable experience. I'll certainly be visiting again. When the screening ends, the audience gets treated to some scientific chat, helping add some context to these sci-fi classics. Our talk discussed if aliens exist and if so, what their subsequent reaction to humans would be. I found the Fermi paradox particularly fascinating - the only downside being, by the time of the discussion, I was melting in my seat. Thankfully, the summer temperatures are now considerably less balmy so you can enjoy 'This Island Earth' on August 15th sweat-free. Find more info and purchase tickets at rmg.co.uk.